Collaboration, that’s the issue with purchase order tracking. Are you a vendor tracking multiple orders from one or more customers? Are you a business that issues many purchase orders against a budget and need to track the outside spend? Whether you are issuing purchase orders or receiving them, it’s important to track the deliverables and the money. Gone are the days when spreadsheet tracking was good enough. Cloud tracking is here! The traditional software solution to this tracking requirement has been spreadsheets, namely Excel. Excel was used because it’s low cost and easy to use. Spreadsheets are cool for all the obvious reasons, so why argue for something better? Business transactions have always been “collaborative” but the methods and time-frames require real-time execution. Noone waits for paper or even emails to see a purchase order transaction execute through the system. Web posts and alerts are needed. Purchase orders are always budgeted items, or should be. PerpetualBudget.com provides the department budget structure to track all project expenditures, especially outside spend in the form of Purchase Orders. Everyone associated with the purchase order items wants and needs to know the status of the order RIGHT NOW. This is only possible with cloud based services. Is the money right and if not, someone fix it! The accounting department needs real-time access to changes, invoices and payments. Cloud solutions are the answer. 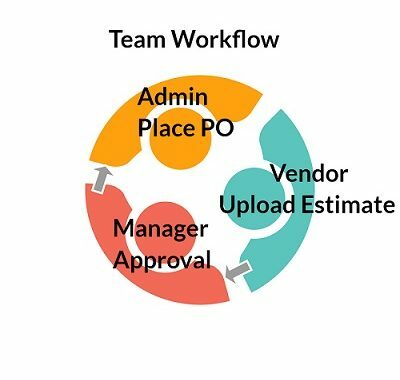 Combining these activities into a workflow describes how a Team works together to create, manage and deliver against purchase orders. And this workflow is functionally the same whether it is a Corporate Department issuing purchase orders or a business receiving purchase orders from their customers. Create your Tracking Application here: Your Email address becomes your <username>, Your Company is a 3-letter abreviation used to track your database,Your Password must be six (6) characters minimum. If you already have an account on PerpetualBudget.com, the account creation may fail citing “duplicate account”. In that case contact us below and we’ll help you. We are ready to train and assist you to create (FREE) a budget and spend management structure that will work for you. Call us at (209) 810-3048 or email us using the form below.